How far along? 28 weeks, babies are the size of eggplants. At the ultrasound this week baby a was measuring 2 lb. 11 oz, and baby b was 2 lb. 8 oz. Which means that these bebes are huge! The average 28 week old fetus is 2 lbs. Total weight gain/loss: 24 lbs. The belly just keeps getting bigger and bigger. Sleep: I am up multiple times every night either because I have to go to the bathroom or because I'm hungry. Clayton will find me downstairs making breakfast at 5 am. And once I'm up and eating breakfast there is no going back to sleep. I have found that if I eat something with a lot of protein, like eggs or peanut butter, right before going to bed then I can avoid the early morning hunger pains. How far along? 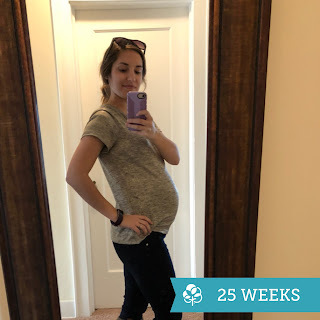 26 weeks, babies are the size of scallions? Whatever that means. Total weight gain/loss: 20 lbs. Only 17 to go to hit the goal at the the end. Sleep: I wake up every morning at 4 and lay awake until 6. I don't know why, maybe my body is trying to prepare for being up periodically at night. Best moment this week: The babies have started to get hiccups. I didn't know even know they could do that yet! Food cravings: I'm always in the mood for smoothies and pizza.